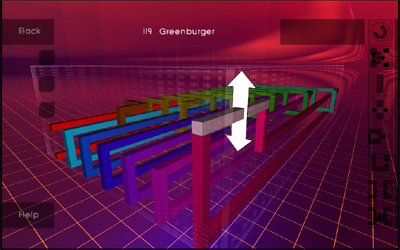 meQuanics is a serious game allowing the user to manipulate real quantum computer circuitry. Like a common puzzle-game, the purely casual user interface does not require any knowledge about the subject matter, the optimizations found by users by playing however are uploaded and contribute to active research in this highly innovative field. Test your “quantum-wits” playing the game preview on the official game website . Zentrifuge contributes in building the game from a prototype state to a visually appealing Unity3D-based game client, providing the user with guidance and incentives to reach even higher-performance circuitry architecture. Since quantum computer circuits have a 3-dimensional topology the biggest challenge in meQuanics is optimizing the circuit manipulation interface to allow for an intuitive grasp of the volumetric structures. Planned improvements towards that goal is support for touch-devices. Learn more on the science behind the project via the meQuanics youTube channel, or get in touch with its people through its FB group. meQuanics is developed by the QIST group at the National Institute of Informatics, Tokyo.